A couple weeks ago, I blogged about my recent visit to Bluff Creek. On that visit, several of us witnessed an amazing knocking display that lasted for over six minutes. Due to low batteries in my microphone's preamp, the recording I obtained was of little or no value other than to demonstrate the cadence of the knocks. Luckily, the group of researchers I associate with believes in redundancy. (Redundancy is, of course, doing things repeatedly, over and over, again and again, more than once, redundantly, like they do in the Department of Redundancy Department.) In the case of bigfoot research, redundancy is having a back-up. My friend Wally Hersom had a recorder at his campsite running all night long (like all good researchers should) in addition to the recorder in my camp, located several hundred yards away. Wally's recording turned out very well, and he has graciously given it to me for use on my website. night's recording at Bluff Creek, CA. 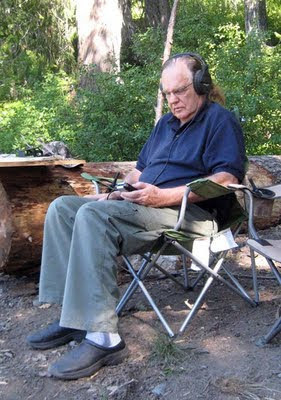 Wally's recording is posted on the www.NorthAmericanBigfoot.com website at this link. When listening to the recording, please keep in mind that the sound source was moving to the southeast, yet the timbre of the popping noise remains the same. As noted in the previous blog, I strongly suspect that the animal was not knocking with wood on wood, but rather it was clapping. Until a sasquatch is visually observed doing this behavior, it will remain in the realm of hypothesis, but for now at least there is some sort of reviewable data to support my idea. On another note, there was a compelling rock-throwing event that occurred on this same trip. The rock was carefully collected, and contact was recently made with an individual associated with forensics law enforcement who might be able to lift some prints or amino acids off of the stone. This is a long shot at best, but it's still definitely worth a try. When results are obtained (either positive or negative results), I will notify the readers. 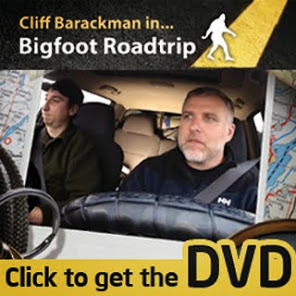 Six minutes of a moving Bigfoot making "knocks"? Amazing! And, interesting theory of Bigfoots hand-clapping. Great Blog, Cliff.